Clairon produce and supply various filter media rolls used in pre- filtration and heavy duty applications. Filter media are available in synthetic and fiberglass from efficiencies ranging from G2 to F5. They are available in rolls and cut to length pads. We are involved in offering a wide range of Filtration Materials (Costin) to our most valued clients. Our range of Filtration Materials (Costin) is widely appreciated by our clients which are situated all round the nation. We offer our range of Filtration Materials (Costin) at most affordable prices. 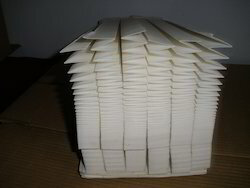 Filter Paper - Laboratory and Industrial Applications. Pressure filtration system for oil. Water and synthetic coolants. The clear choice for coolant filtration from USA.